LOWEST PRICING GUARANTEED ON SAME ITEM/SAME TERMS (SHIPPING). PLEASE EMAIL ANY REQUESTS WITH ITEM, COMPETITOR WEBSITE, AND YOUR INFORMATION TO INFO@SPAANDPOOLSTORE.COM. $4.95 shipping charge for orders less than $49. Most items will ship the same day if your order is received before 4pm PST! These will ship UPS Ground/USPS Priority. Special order products or made to order items (like spa covers) may take 4-6 weeks to receive. Spa covers will be delivered by a freight truck with a scheduled delivery, so please be sure to leave a valid phone number for contact. Acrylic filter lids are also a special order item and can take up to 3 weeks. Shipping restrictions: We cannot ship to a Post Office Box. We cannot ship to Alaska, Hawaii, or any foreign country. We cannot ship to any military base or local, state or federal government facility. All shipping is by ground shipment only. We cannot ship chemicals overnight or by air shipment, please call for expedited shipping on parts. We cannot ship chemicals via USPS, all chemicals must be shipped via UPS. USPS shipments are only parts that can fit in a padded envelope, we only ship Priority. 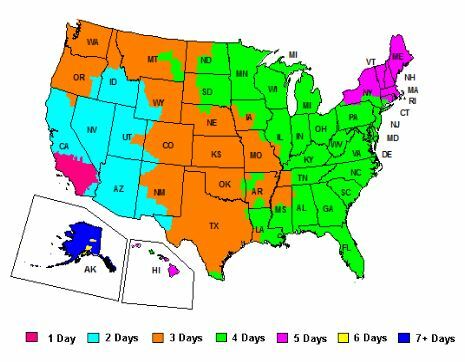 We cannot ship spa covers to Alaska or Hawaii (Freight Shipment). The map displayed above is only used as a reference of FREE SHIPPING service area. Service days displayed are estimated, and only apply to UPS Ground shipments. The days are approx. transit times from UPS, after the package has been shipped. WE CANNOT SHIP SPA COVERS TO ALASKA OR HAWAII. ALL SPA COVERS ARE MADE TO ORDER AND CAN TAKE 4-6 WEEKS TO RECEIVE. A TRUCKING COMPANY WILL DELIVER. MAKE SURE WHEN YOU SIGN THAT YOU SIGN THAT THE COVER IS FREE AND CLEAR OF ALL DAMAGES! IF YOU ARE NOT CERTAIN-PLEASE WRITE 'POSSIBLE CONCEALED DAMAGE'. WE CANNOT BE RESPONSIBLE FOR DAMAGES IN TRANSIT. IF YOU LIVE IN A RURAL AREA--THERE MAY BE AN EXTRA DELIVERY FEE. Spa covers, filter cartridges that is used or has been wet, spa equipment packs, heaters and any electrical items (including but not limited to: circuit boards, spa control panels, contactors, switches, sensors, speakers, transformers, pumps and motors). Manufacturer's warranty still apply and can be returned for warranty only. Maximum manufacturer's warranty on electronics is 6 months. Should you need to return an item for warranty, please contact us immediately for further instruction. With most items, will have you send back the item for warranty inspection, reimburse you for shipping (ground shipping only), and send you out a new part within 3 days of receiving the defective item. Some items may be replaced directly by the manufacturer, we will help facilitate this replacement. Should it be deemed not a manufacturer defect, you will be responsible for shipping both ways. On non-defective merchandise, the customer is responsible for the cost of return shipping and insurance. Handling charges and special shipping charges, if any, are not refundable for non-defective merchandise return. All sales on clearance items are final. Most items are returnable for a full refund of the item price, as long as they are returned within 30 days of your receipt. They must have their original packaging and be unused. If we make a mistake and send you the wrong item, we will send you a call tag to ship the original item back to us and the replacement item will be sent to you. If we do not receive the original item back within 60 days of receipt of the call tag, then you will be charged for that item. To return an item, please call us at 1-888-571-9020 (Monday – Friday, 10AM-5PM Pacific Time) for a Return Merchandise Authorization number (RMA). You can also email us at info@SpaAndPoolStore.com. Include your order number, name, the item number for the item you are returning. We will then contact you with a RMA Number and shipping instructions for your return. PLEASE DON’T SEND A PACKAGE BACK WITHOUT AN RMA. To receive full credit, items must be shipped within 10 days from the day the RMA Number and shipping information were provided. If an order is cancelled once the item has shipped, our standard return policy applies. You will need to accept delivery of the item, obtain an RA Number and ship the item back. If delivery of an item is refused, the return shipping costs will be deducted from the issued credit. Second-Day and Next-Day shipping costs will not be credited if delivery of the item is refused. Once the item is received, we will credit the credit card used for the purchase. If you paid by check or money order, we will issue a check within two weeks. Of course, if any item is defective, or damaged in shipping, please call us at 1-888-571-9020 (Monday – Friday, 10AM-5PM Pacific Time) or email us at info@SpaAndPoolStore.com within 2 weeks of receiving your shipment. We will arrange for the item to be picked up, and you will be credited with both the purchase and shipping costs. Complete - If the total order is less than $250.00, the order will be held until all items are available to ship as one unit. If you would like us to ship the items that we have in stock at the time of your order, you may be responsible for the cost of the second shipping charge. Partial - For orders with a total of $250.00 or more, the order will ship as the items become available, with a maximum of two shipments, and the second shipment being FEDEX Ground or USPS Priority Mail, at our discretion. You will NOT be charged any additional fees if we choose to ship your items in partial shipments. While there may be some exceptions (such as including on your order an item that is properly displayed on our site as out of stock), we will follow the above shipping policies for most orders.